If you're thinking about buying a home in 2017 but wondering if it's a good time to buy a home or if you should keep renting, keep reading, watching or listening. I'll answer that question by talking about the two major sides of home buying. Also share a bit about trying to time the market, home affordability and what Katherine, my wife and business partner, and I are doing. There's just no easy answer to the question,"Is Now A Good Time To Buy A Home?" Home prices are certainly up. And some people think that's good and means now is a good time to buy. Some people look at home prices going up as a bad sign and a reason to not buy right now. Buying a home is a very personal decision, so the answer to timing also has to be very personal. Even if all signs in the real estate market pointed to "YES," now is a good time to buy, but you have uncertainty in your life, job, money, etc. that means it's not a good time to buy. Unless you have cash to buy a home or buy a condo, you'll be getting a mortgage. And a small increase in mortgage rates and can have a big impact how much house you can afford. For every .5% (one-half) percent increase in your mortgage interest rate your purchasing power may be decreased by 4 to 5 percent. For every 1% rate increase, your purchasing power may be decreased by roughly 10%. Example: You're approved for a Principal & Interest (P&I) monthly payment of $1,200. But watch what happens when the mortgage interest rate is now 5.5%. The maximum sales price decreases to $265,000. With 20% down payment, the loan amount is now $216,000 or a 10% decrease in purchasing power. So people who are waiting for home prices to come down, you better hope mortgage interest rates don't go up or all that waiting was for nothing. Katherine and I are out looking right now. On average, it looks like we buy a home every 2.5 - 3 years. This cuts out the "timing the market" factor. We've never bought at the best time. But we've never bought at the worst time either. Granted he is talking about the stock market and not the real estate market. But both ideas run parallel in my opinion. Don't try to time either. Waiting is a mistake. We're looking at homes for sale with a bit more square footage for a personal residence. And also looking at investment property. I'm even looking back in Wisconsin to buy something with my brother. Since our real estate investment strategy is buy and hold, we feel like there is rarely a bad time to buy. There are bad times to sell real estate and we try to avoid that. But our philosophy is don't wait to buy real estate. 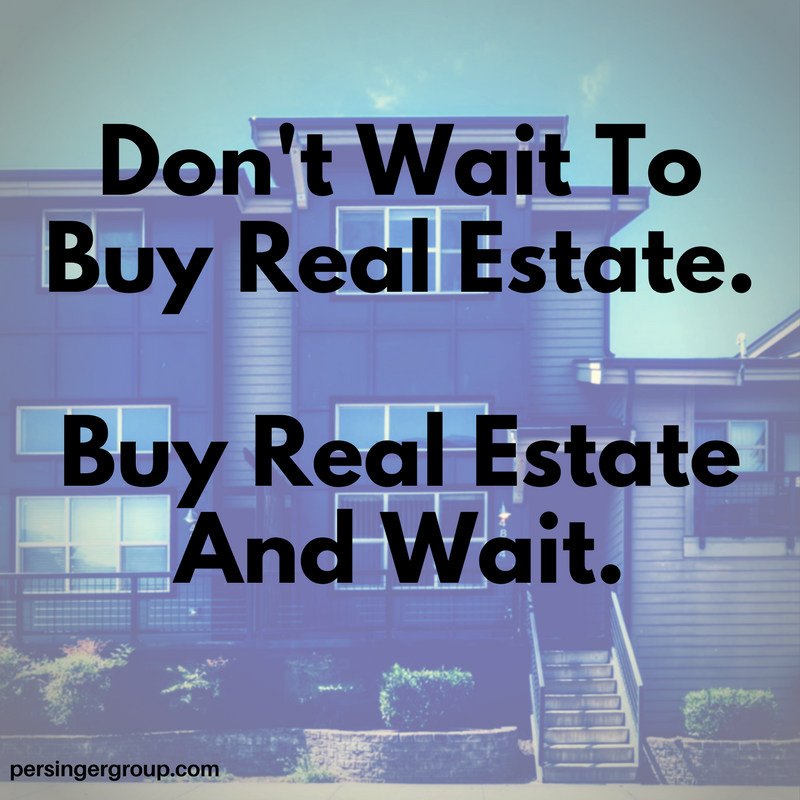 Buy real estate and wait. There are always two sides to home buying. 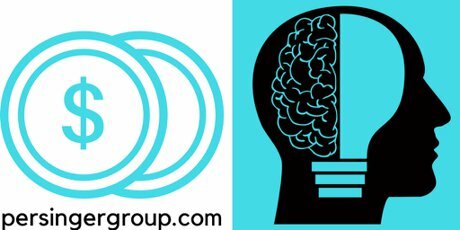 The financial side and the psychological side. The main question that you have to answer for yourself is, "What's the alternative? If now is not a good time to buy a home for me, what's the alternative?" You're most likely renting, right? If renting is the alternative for you, how is that really going? Are rental prices locked in? Have they stayed stagnant? Are they that much lower than what home values are doing? According to Seattletimes.com, rental prices in Seattle have gone up 57 percent over the last six years. Your rent that you're paying, that $1,000 that $1,500, that $2,000, that $2,500 a month that you're paying in rent is going straight out of your pocket into the landlord's pocket. When you're buying a home, you have a portion of the money that's going out for property taxes, but you get to write that off. You have a portion of the money that's going out for your interest rate, but you get to write that off. And then of course you have your upkeep and your maintenance of it, but depending on the type of home that you're buying and what you personally want to do for the home, that cost is fairly in your control. 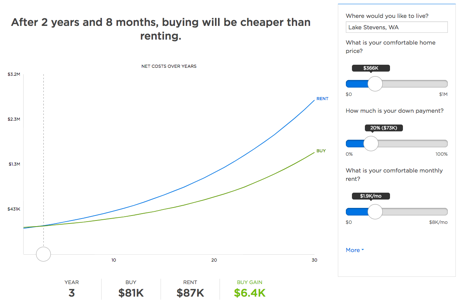 If you've never checked out the Rent vs Buy Calculator from Zillow, it's actually pretty cool. It looks at markets and trends, and gives you a break even number. It says that after 3 years and 2 months, buying a home is cheaper than renting. Cost: After 3 years, your total cost of homeownership (down payment, mortgage, taxes, etc.) for a $529,100 home in Bothell, WA would be $240,005. Your total cost to rent would be $98,117. Renting leaves you with $141,888 in your pocket (including the money you didn't spend on a down payment). Gain: After three years, if you buy, your home will have $211,343 in equity (available to you when you sell). However, if you instead rent and invest your down payment and the other money you save, at a 6% return rate it will earn around $21,018 in three years. 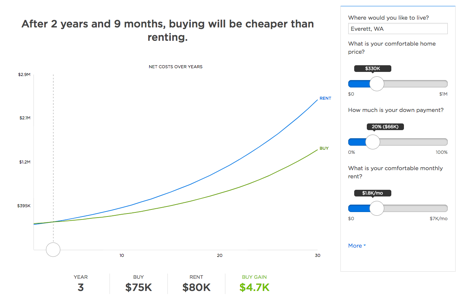 Bottom line: Looking at your gross costs, equity and investment potential, it's better for you to buy than rent if you plan to live in your home more than three years and two months. It says that after two years and eight months, buying a home is cheaper than renting. Cost: After three years, your total cost of homeownership (down payment, mortgage, taxes, etc.) for a $366,200 home in Lake Stevens, WA would be $172,961. Your total cost to rent would be $82,828. Renting leaves you with $90,133 in your pocket (including the money you didn't spend on a down payment). Gain: After three years, if you buy, your home will have $146,275 in equity (available to you when you sell). However, if you instead rent and invest your down payment and the other money you save, at a 6% return rate it will earn around $13,889 in three years. 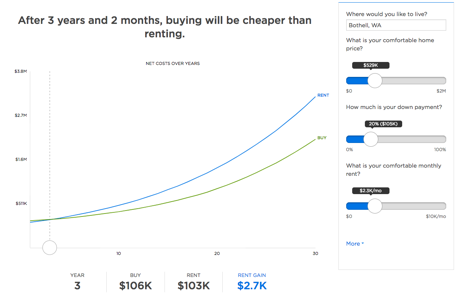 Bottom line: Looking at your gross costs, equity and investment potential, it's better for you to buy than rent if you plan to live in your home more than 2 years and 8 months. It says that after two years and nine months, buying a home is cheaper than renting. So you can see for yourself, in a short period of time buying becomes the better financial decision. But if buying a home was only a financial decision it would be easy. For many it's not though. There's an emotional and psychological side to home buying. It could be that you're uncertain with a relationship, whatever it might be, psychologically you might not think it's a very good time for you. An interesting thing we've noticed is that some people look at increasing home values as a reason to have faith in the market, and therefore look at right now is a great time to buy. On the other side of the coin, some people look at home prices going up as a bad thing. People view things differently through a psychological lens. Everything's framed a little bit different for each individual. So part of the process of deciding if now is a good time to buy, you have to look at how you view it. By the way, it seems like once someone becomes a homeowner, they view themselves as a homeowner. Katherine and I have helped several home buyers relocate to the area, that have never lived here before and they buy a home immediately. They owned their home in their last location so psychologically they view themselves as homeowners. And yet, there are some people that have lived in this area their entire lives and will live here their entire lives but postpone buying for their own psychological reasons. Now for the media portion. This is episode 50 of the Inside Real Estate Show where I answer the question "Is now a good time to buy a house?" This is the video of the episode. You can listen to this episode below or on iTunes, or at Stitcher. Or whereever you listen to podcasts. Darin Persinger: Home prices have been going up. Interest rates are still relatively low but starting to creep up. We get this question almost daily right now. "Is now a good time to buy a home or did I miss my chance? Should I wait for home prices to come back down?" In episode 50 of the Inside Real Estate Show, I'll do my best to answer the question, "Is now a good time to still buy a home?" We'll talk a little bit about trying to time the real estate market. I'll share with you what Catherine and I are personally doing with real estate. Speaker 2: This is the Inside Real Estate Show where we give you the insight behind the information, so you can make smart home buying, home selling, and real estate investing decisions. And now your host, author, speaker, broker, and investor, Darin Persinger. Darin Persinger: Unless you're one of the people that can afford to buy a home with straight up cash, the home value is just one piece of the puzzle when you talk about affordability. And you want to answer the question, "Is now a good time to buy?" Another component of that, a big component, of home affordability is the interest rates. 18.5 percent. I want you to lock that number into your head for a second. Just think about this number. 18.5 percent. That is what mortgage interest rates were in October of 1981. 18.5 percent. Current interest rate today according to bankrate.com 4.04 percent for a 30 year fixed. 18.5 percent. 4.04 percent. Do you think home affordability is impacted by interest rates? Do you think people in 1981 are trying to figure out, "How do I afford a home if I have to pay 18 percent on the interest rate?" So interest rates is just one piece of the puzzle to look at when you're talking about is now a good time to buy, you're trying to time the market, you're looking at home affordability, because even if home prices start to flat line a little bit, what happens if interest rates keep ticking up, which they are? So as we dive into this, something I want you to think about. When I look at buying a home, there's always two huge components, hundreds of components underneath these two, but the two major ones that you're dealing with, that I deal with as a real estate agent on consulting a buyer, helping them through this process, is you have the financial side of it and you have the psychological side of it. So buying a home involves both the psychological and the financial side and you have to be confident in both of those for you to feel confident in buying home. If it doesn't make sense for you because your finances aren't in order, then you're not going to look at right now as a good time to buy. If for some reason psychologically, you think now is a bad to buy, whatever, you're uncertain with your job, you're uncertain with a relationship, whatever it might be, psychologically you might not think it's a very good time for you. An interesting thing is that some people look at home prices as going up as being a good thing so they look at right now is a great time to buy because home prices are going up. On the other side of the coin, some people look at home prices as going up as a bad thing. So they now think that buying a home right now is not a good time to buy. That's just how people view things differently through a psychological lens. Everything's framed a little bit different for each individual. So part of the process of deciding is now a good time to buy? You have to look at how do you view it? How do you frame it? I'll share with you how Catherine and I view buying a home right now. Quick backstory though. To give you a timeline on when I've bought homes. I bought my first home in May of 2001. My second home in September of 2003. Then I bought again in October of 2005. Catherine bought her first home in April of 2009. We bought a home together in August of 2013. We bought a home again in December of 2015 and right now we're out looking for homes. Every different type of style of home, because we still think it's a good time to buy. Last night, we went and looked at a personal residence for ourselves, something that we might buy that we're going to move into. We're still looking at investment properties. I'm looking at homes back in Wisconsin with my brother to buy as an investment property as a vacation home. So we're looking in different location and in different price points and for different reasons, maybe as a personal residence, maybe as a second home, maybe as an investment property. So once tactic that you can take on trying to time the market is if you're buying a home basically on average two and a half, three years or so, you're never buying at a good time, you're never buying at a bad time. That's one way to kind of hedge your bets. Let's talk about the psychological side of buying a home. A Chinese proverb comes to mind here, "The best time to plant a tree was 20 years ago. The second best time to plant a tree is today." I think that proverb transitions well into buying a home or buying real estate. There's a saying in real estate that you don't wait to buy real estate, you buy real estate and wait. One thing that I'm seeing right now is people that are basically doing what I call live-in flips. They're buying homes and then selling them less than two years later. Catherine and I own a home in a brand new community. The homes here are less than two years old, and there's a lot of homes that are being listed and sold already. I think that's a very dangerous thing when you talk about trying to time the market. And I call this live-in flipping. The reason why I think live-in flipping is dangerous is you could get stuck in it, the market could shift on you at a certain moment, you have the cost of the sale, and then you have the capital gains tax on top of that if you've lived in it for a short period of time. So I look at that risk of was it worth the potential gain for the potential loss that you could have taken on that sale? Or just the actual cost and risk involved in the moving, buying, locking your money up into a property for that short period of time and then what you could have been doing differently with it so the other opportunity cost that you could have used with that capital. 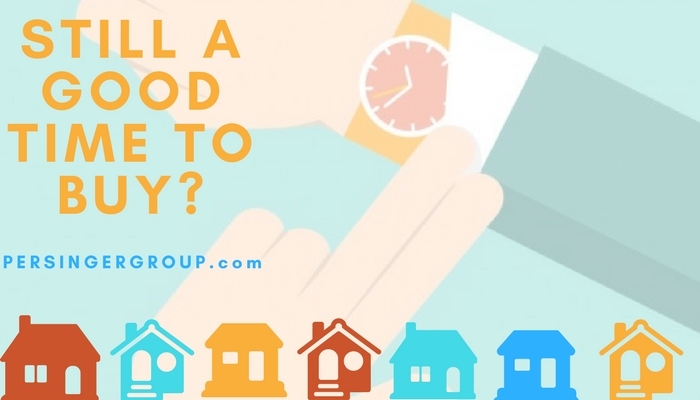 One of my philosophies with real estate is that there's no bad time to buy thus the reason why we've boughten every two and a half, three years or so on average. There's no bad time to buy. There's just a bad time to sell. It's like the stock market. If you want to just go and Google trying to time the stock market or should I buy or sell when the stock market is going down? There's a lot of information that you can transition from trying to time the real estate market over to trying to time the stock market. The only time that you lose money in the stock market is when you sell when the market is down. The same thing happens in real estate. People only lose their money when they sell when the real estate market is down. If they just hold onto the property, home prices came back at the lowest point, people are able to sell and make a profit on their home not just because they paid down principle, because home prices have come down and increased a little bit since it's lowest point, overall, on average. So my philosophy is there's no bad time to buy, just a bad time to sell. So going back to own personal timeline, one of the reasons why I've only actually sold one of my homes every, Catherine and I are a buy and hold type of real estate investor. Now to the other side of the coin, the financial side. The main question that you have to answer for yourself is, "What's the alternative? If now is not a good time to buy for me, what's the alternative?" What else are you doing? You're most likely renting, right? So if renting is the alterative for you, how is that really going? Are rental prices locked in? Have they stayed stagnant? Are those that much lower than what home values are doing? Well according to Seattletimes.com, rental prices in Seattle have gone up 57 percent over the last six years. And the median price of home values has doubled. So to me, that basically is a wash. You have a slight margin of error on whether you're renting or buying. All and all, if you're planning on staying any place for a certain period of time, most likely at least three years, I've even seen some data that can push it down to two years, if you're staying some place for two years, it's actually better to buy than rent. But I would say at least three just to be a little conservative. If you're going to stay any place for at least three years, why not look at buying? Because what's the alterative? Your rent that you're playing, that 1,000 dollars, that 1,500, that 2,000, that 2,500 a month that you're paying in rent is going straight out of your pocket into the landlord's pocket. When you're buying a home, you have a portion of the money that's going out for property taxes, but you get to write that off. You have a portion of the money that's going out for your interest rate, but you get to write that off. And then of course you have your upkeep and your maintenance of it, but depending on the type of home that you're buying and what you personally want to do for the home, that cost is fairly in your control. So to recap the information in episode 50 of the Inside Real Estate Show, there's two sides of the coin that you have to look at when deciding if now is a good time to buy, the psychological side and the financial side. Psychologically, are you there yet? Are you mentally prepared to be a home owner? If you're not psychologically prepared for it, it's never going to be a good time for you, until you're read why psychologically, you're not ready to be a homeowner, you'll always see a reason why it's not a good time to buy. Like I said, some people see home prices as going up as a good thing. Some people see home prices going down as a good thing. It depends on what your perspective is, how you view the real estate market, and how you view home ownership. What does a home represent to you? What does it mean to you? Until you're psychologically prepared for it and you see it as something that you want, it will never be a good time for you to buy. On the other side, financially. Are you ready financially for home ownership? What else are you doing with that capital? What's the opportunity cost of what you could be doing with it? One of the things I look at, if you're really trying to time the market, I would give you advice that Warren Buffet says. And I think Warren Buffet is an okay person to take advice from when you look at trying to time things and when he talks about timing the stock market, he calls it a mistake. He says, "Trying to time the stock market is the number one mistake to avoid." And again, I think the stock market and real estate market, the idea of trying to time them, those two things run in parallel. Don't try to time the stock market, don't try to time the real estate market. Look at your own situation and whether it's good timing for your or not, and only you can actually answer that question for yourself. Just like Catherine and I look at, right now is a good time for us to buy. We think just because home prices are up that doesn't impact us on thinking that now is a bad time to buy. There's certain things that we're looking for in an investment, certain things that we're looking for in a personal residence and for us, right now would be a good time to buy. How about for you? Would now be a good time for you to buy? If it is, contact us or just head to PersingerGroup.com and start your real estate search there. I want to thank you for watching and listening and like this and subscribe to this wherever it is, whatever your platform you're on, watching and listening to this. An upcoming episode, I want to dive deeper into the idea of trying to time the market. I'll go in depth into that and why it's a mistake and the problems that trying to time the market can create for you. And if you have questions, you can email me darin@persingergroup.com. I'll either answer your question in an email back to you or possibly use your question to answer that and create an episode of Inside Real Estate Show. So if you have questions, email them darin@persingergroup.com. 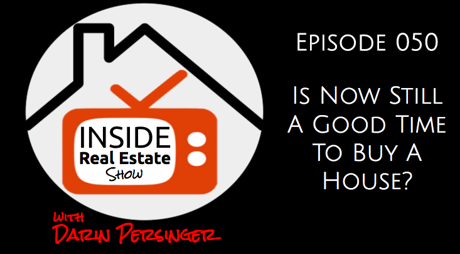 If you want to listen to more episodes or watch more episodes, visit insiderealestateshow.com. I'll see you on the next episode. Speaker 2: This is the Inside Real Estate Show where we give you the insight behind the information, so you can make smart home buying, home selling, and real estate investing decisions. If you have questions about this project, video or real estate - you can email us.